This gluten-free and plant based take on the classic is quick and easy comfort food that's way better than takeout. You can switch up the veggies and for the omnivores in your family, feel free to add stir fry chicken. Most people think of General Tso’s as a deep fried dish but if you add the General Tso’s sauce to stir fried veggies, chickpeas or even chicken, you get the same delicious flavor only healthier. And so quick and easy! This dish is a huge hit in our house so we make it often with a variety of vegetables depending on mood or what we have in the house. 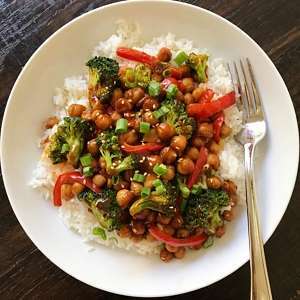 This plate is broccoli, peppers & chickpeas all quickly sautéed and stir fried with a General Tso’s Sauce, and served over rice. The General Tso’s sauce, recipe adapted from Pinch of Yum, is a little sweet, a little spicy and so YUMMY. The entire dish takes less then 30 minutes to make and is flavorful, nourishing and satisfying. A healthier and delicious take on the classic deep fried version. 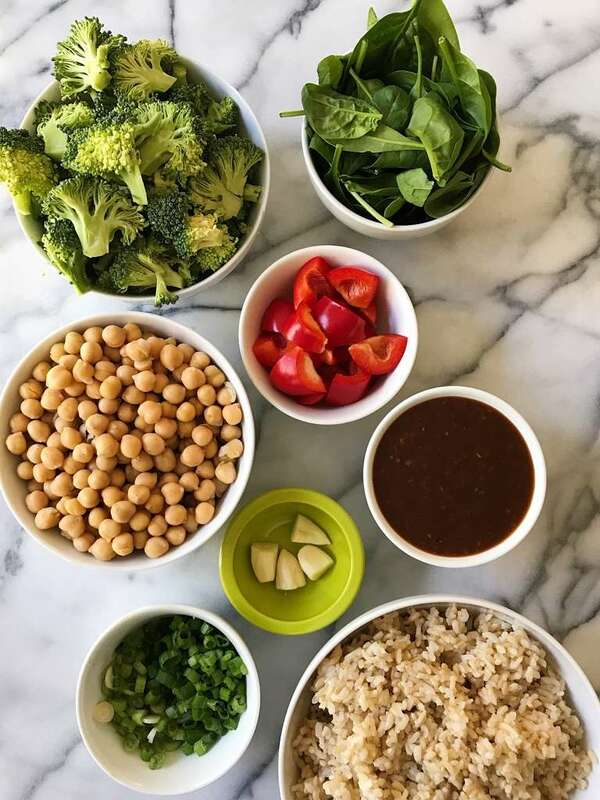 Sautéed veggies, chickpeas or even chicken stir fried with a General Tso's sauce adapted from Pinch of Yum. A quick and easy meal. Add remaining ingredients and whisk to combine. Simmer for 15-20 minutes or until sauce is thickened. Set aside. So glad you loved it! Thanks for sharing!